Welcome to Purposed Physical Therapy's patient resource about Collateral Ligament Injuries. The collateral ligaments are commonly injured parts of the knee. An injury to these ligaments usually involves a significant force, such as a fall while skiing or a direct impact to the side of the leg. Where are the collateral ligaments, and what do they do? Ligaments are tough bands of tissue that connect the ends of bones together. There are two collateral ligaments, one on either side of the knee, that limit side to side motion of the knee. The medial collateral ligament (MCL) is found on the side of the knee closest to the other knee. 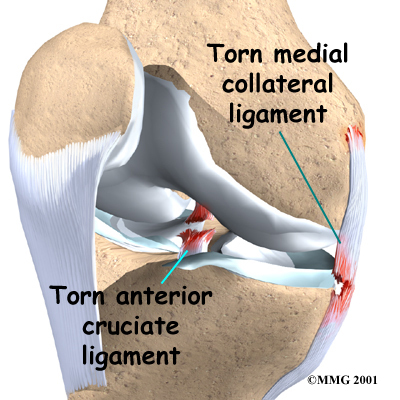 The lateral collateral ligament (LCL) is found on the opposite side of the knee. Together, the collateral ligaments also work with the posterior cruciate ligament (PCL) to prevent excessive motion of the tibia posteriorly (back) on the femur. When the lateral (outside edge) of the capsule is injured, the MCL reduces anterolateral rotatory instability (ALRI). In other words, the MCL acts as a restraint to rotation. ALRI means there’s too much rotation of the tibia (shinbone) relative to the femur (thighbone). If an injury causes these ligaments to stretch too far, they may tear. The tear may occur in the middle of the ligament, or it may occur where the collateral ligament attaches to the bone, on either end. If the force from the injury is great enough, other ligaments may also be torn. The most common combination is a tear of the MCL and a tear of the anterior cruciate ligament (ACL). The ACL runs through the center of the knee and controls how far forward the tibia moves in relation to the femur. 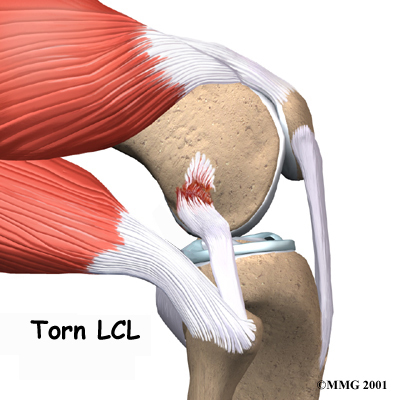 MCL tears are more common than LCL tears, but a torn LCL has a higher chance of causing knee instability. One reason for this is that the top of the shinbone (called the tibial plateau) forms a deeper socket on the side nearest the MCL. On the other side, near the LCL, the surface of the tibia is flatter, and the end of the shinbone can potentially slide around more. This difference means that a torn LCL is more likely to cause knee instability. 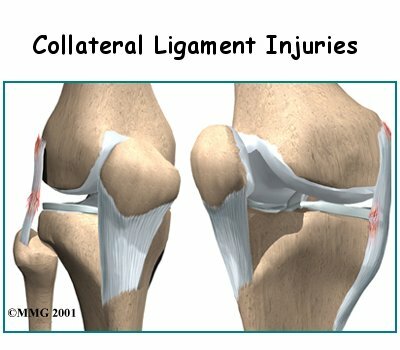 How do collateral ligament injuries occur? The collateral ligaments can be torn in sporting activities, such as skiing or football. The injury usually occurs when the lower leg is forced sideways, either toward the other knee (medially) or away from the other knee (laterally). A blow to the outside of the knee while the foot is planted can result in a tear of the MCL. Slipping on ice can cause the foot to move outward, taking the lower leg with it. The body weight pushing down causes an awkward and unnatural force on the whole leg, much like bending a green stick. The MCL may be torn in this instance because the force hinges the medial part of the knee open, putting stress on the MCL. Repetitive activities that involve forceful rotation of the lower leg such as the whip kick in swimming may also cause the MCL to break down or tear over time. The LCL is most often injured when the knee is forced to hinge outward away from the body. It can also be torn if the knee gets snapped backward too far (hyperextended). 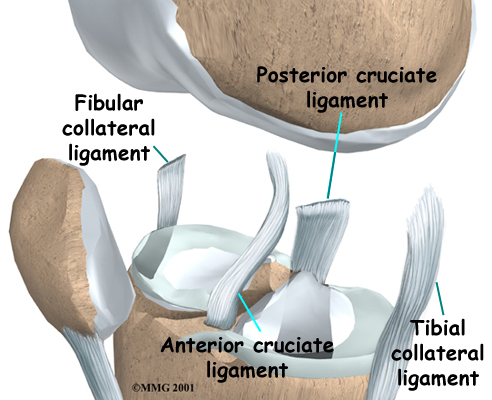 How do collateral ligament injuries cause problems? An injury violent enough to actually tear one of the collateral ligaments causes significant damage to the soft tissues around the knee. There is usually bleeding and swelling into the tissues surrounding the knee. The damage may also cause bleeding into the knee joint itself. The knee becomes stiff and painful especially when putting weight on that leg. As the initial stiffness and pain subside the knee joint may feel unstable, and the knee may give way and not support your body weight. Chronic, or long-term, instability due to an old injury to the collateral ligaments is a common problem. If the torn ligament heals but is not tight enough to support the knee, a feeling of instability will continue to be felt. The knee will give way at times and may be painful with heavy use. When you visit Purposed Physical Therapy, our initial physical examination will usually give a very good indication of which ligaments have been torn in and around the knee. In some cases, there is too much pain and muscle spasm to completely tell what is damaged in your knee. We may suggest a period of rest with a knee splint and then reexamine the knee in five to seven days. This will allow some of the initial pain and spasm to decrease, and the exam may be more reliable. We can perform special stress tests to assess for gapping or rocking between the tibia and femur. When force is applied, too much motion along the joint line is a sign of collateral ligament damage. Tenderness along the joint line without significant gapping may be an indication of a mild sprain (a few fibers are torn). With a complete tear, there is no sense of an endpoint or stop to how far the joint space will open or gap. When you begin your Physical Therapy, our initial treatments for a collateral ligament injury will focus on decreasing pain and swelling in the knee. Rest and anti-inflammatory medications, such as aspirin, can help decrease these symptoms. You may need to use crutches until you can walk without a limp. Most patients receive Physical Therapy treatments for collateral ligament injuries. Our Physical Therapists may treat the swelling and pain with ice, electrical stimulation, and rest periods with your leg supported in elevation. We will use exercises to help you regain normal knee movement. Range-of-motion exercises are normally started right away with the goal of helping you swiftly regain full knee movement. This includes the use of a stationary bike, gentle stretching, and careful pressure applied to the joint by our Physical Therapist. Exercises are also used to improve the strength of the quadriceps muscle on the front of the thigh. As your symptoms ease and strength improves, your Purposed Physical Therapy Physical Therapist will guide you through advancing stages of exercise. When you get full knee movement, your strength is improving, and your knee isn't giving way, you'll be able to gradually get back to your work and sport activities. We may prescribe the use of a functional brace for athletes who intend to return quickly to their sport. These braces support the knee and protect the collateral ligaments. Although recovery time varies, minor sprains of either the MCL or LCL often get better within four to six weeks. Moderate tears should rehabilitate within two months. Severe MCL tears require up to three months. Patients who are still having problems after three months may need surgery. Severe tears or ruptures of the LCL are the trickiest, because they tend to leave the knee joint the most unstable, and patients with this condition typically don't do well with non-surgical care. Patients who continue having periods of swelling or instability in the knee may also need surgery to correct their problem. Rehabilitation proceeds cautiously after surgery of the collateral ligaments, and the treatments our patients receive vary depending on the type of surgical procedure that was used. Some surgeons have their patients use a continuous passive motion (CPM) machine after surgery to help the knee begin to move and to alleviate joint stiffness. Most patients are prescribed a hinged knee brace to wear when they are up and about. Surgeons occasionally cast the leg after reconstruction surgery of the LCL. Patients are strongly advised to follow the recommendations about how much weight to place on the leg while standing or walking. After a ligament repair, you should put little or no weight on your foot when standing or walking for up to six weeks. Weight bearing may be restricted for up to 12 weeks after a ligament reconstruction. When you begin your Purposed Physical Therapy post-surgical therapy program, the first few treatments are designed to help control the pain and swelling from surgery. Our goal is to help you regain full knee motion as soon as possible. Our Physical Therapist will also work with you to make sure you are using the crutches safely and only bearing the recommended amount of weight while standing or walking. As the rehabilitation program evolves, we will choose progressively more challenging exercises to safely advance your knee's strength and function. Ideally, you will be able to resume their previous lifestyle activities. However, some patients may be encouraged to modify their activity choices, especially if an allograft procedure was used. At Purposed Physical Therapy, our goal is to help you keep your pain under control, ensure safe weight bearing, and improve your strength and range of motion. When your recovery is well under way, regular visits to our office will end. We will continue to be a resource, but you will be in charge of doing your exercises as part of an ongoing home program. X-rays may be required to rule out the possibility that any bones have been damaged. Stress X-rays may be useful to confirm that one of the collateral ligaments has been torn. Stress X-rays are plain X-rays taken with someone attempting to open the side of the joint that is suspected of being unstable. The X-rays will show a widening of the joint space on that side if instability is present. Magnetic resonance imaging (MRI) may be ordered if there is evidence that multiple injuries have occurred, including injury to the ACL or meniscus (a special type of cartilage in the knee joint). The MRI machine uses magnetic waves rather than X-rays to create pictures that look like slices of the knee. This test does not require any needles or special dye and is painless. If there is uncertainty in the diagnosis following the history and physical examination, or if other injuries in addition to the collateral ligament tear are suspected, an MRI scan will probably be suggested. 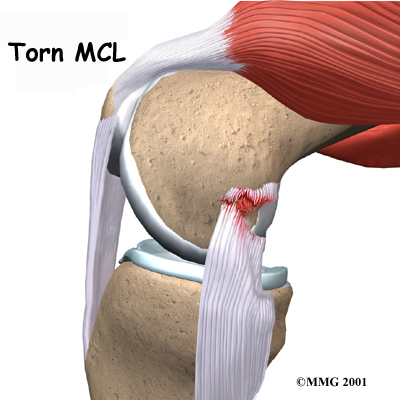 An isolated injury to the LCL or MCL rarely requires surgical repair or reconstruction. Partial tears to the LCL, such as Grade 1 or Grade II injury, are usually treated by reduced activity and allow the ligament healed with or without a brace for several weeks. Most doctors opt not to immobilize the knee in a cast when the MCL is torn. Some doctors prefer to issue their patients a knee brace after the injury if there is significant pain and instability. If other structures in the knee are injured, surgery may be required. Some surgeons feel that a combination of an ACL tear and an MCL tear should be treated surgically. Others disagree and feel that the MCL tear should be treated nonsurgically at first and the ACL reconstructed later. Time will tell if one approach is better than the other. Repair of a recently torn collateral ligament usually requires an incision through the skin over the area where the tear in the ligament has occurred. If the ligament has been pulled from its attachment on the bone, the ligament is reattached to the bone with either large sutures (strong stitches) or special staples called suture anchors. Tears of the middle areas of the ligament are usually repaired by sewing the ends together. Chronic swelling or instability caused by a collateral ligament injury may require a surgical reconstruction. Reconstruction differs from repair of the ligaments, described earlier. A reconstruction operation usually works by either tightening up the loose ligament or replacing the loose ligament with a tendon graft. In the tightening procedure, your surgeon will use the remaining ligament tissue and take up the slack (similar to taking in the waist on a pair of pants). This is usually done by detaching one end of the ligament from its place on the bone and moving it so that it becomes tighter. The ligament is then reattached to the bone in the new place and held with sutures or metal staples. If a tendon graft is needed to replace the loose ligament, it is usually taken from somewhere else in the same knee. Taking tissue from your own body is called an autograft. A common autograft that is used is one of the hamstring tendons called the semitendinosus tendon. Studies have shown that this tendon can be removed without affecting the strength of the leg. This is because other bigger and stronger hamstring muscles can take over the function of the tendon that is removed. In this operation, your surgeon will use the tendon graft to replace the damaged collateral ligament. The ends of the tendon graft are attached to the bone using large sutures or metal staples. Another way to replace a badly torn collateral ligament is with an allograft. For this procedure, the surgeon gets graft tissue from a tissue bank. This tissue is usually removed from an organ donor at the time of death and sent to a tissue bank. There the tissue is checked for infection, sterilized, and stored in a freezer. When needed, the tissue is ordered by the surgeon and used to replace the torn collateral ligament.